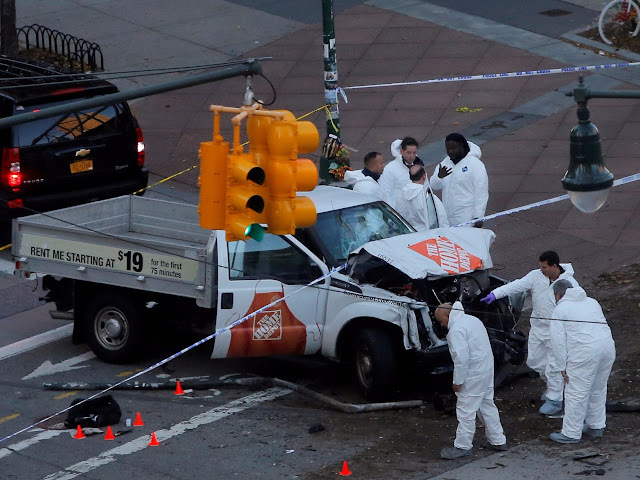 At least eight people were killed Tuesday, October 31, 2017, in New York during a terror attack. Around 3:05 p.m. on Tuesday a man drove a truck onto the West Side Highway bike path. The truck was a rental from Home Depot. The driver continued down the path, hitting bicyclists and pedestrians. The truck then struck a school bus at Chambers Street. Witnesses said the suspect yelled "Allahu Akbar," The driver was fired at by a police officer, hitting him in the stomach. The driver of the truck was taken into custody. The driver after his arrest, underwent surgery. He has been identified as Sayfullo Habibullaevic Saipov, a 29-year Uzbek national who came to the United States in 2010. Law enforcement found a note near the truck claiming the attack was carried out in the name of ISIS.